“Brothers” Eric, Ryan and Ron, gospel ministry preachers, arrived on the Rehoboth Beach boardwalk Friday to spread their message that “Jesus is the only way to God and you must be born again to enter the Kingdom of God.” They are from the Gospel Invasion Ministries. 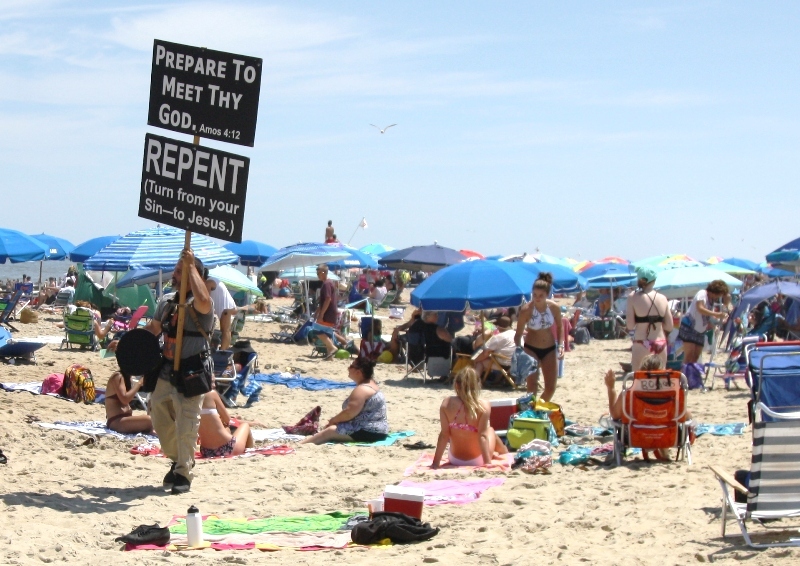 Unlike previous religious groups that have used the beach and boardwalk, such as the Jehovah’s Witnesses and the open-air evangelists, this group is much more proactive. 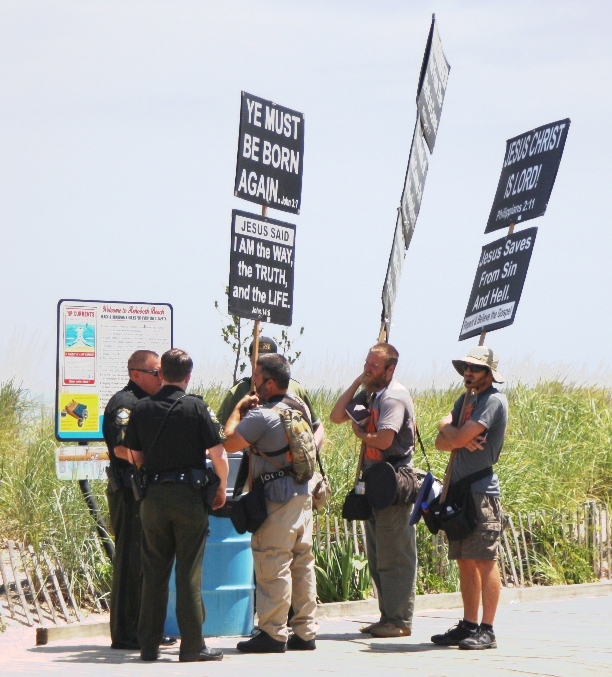 The three of them walked among tourists on the beach while preaching their sermons with their strong voices, holding distinctive black and white signs and distributing fliers. Police explained that the city’s ordinance allows them to distribute only non-commercial fliers only to people who willingly accept them. The trio split up on the beach and covered quite a bit of beach between the Henlopen and the Star of the Sea for more than two hours. The temperature was in the mid-70’s. Lifeguards directed several complaints to the police, and the police, who had been monitoring the group, explained that the men were not violating city ordinances. Brother Ron said on Saturday that they come to preach at large events and venues such as the Vegas Strip, sports stadiums and were attracted to Rehoboth Beach because it allows them to easily reach a large diverse group of people. “We want to comply and we want to be within the law,” he added, with regard to the various ordinances. He says officials in some jurisdictions sometimes try to discourage them by making legal claims that are simply unsubstantiated. On Saturday, he said they continued their journey on the beach in Ocean City and would attend church on Sunday.